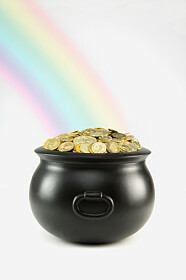 Looking At The End of the Rainbow For Your Claims Satisfaction Pot Of Gold? There is some truth to these views. If having more people means that estimates are completed earlier, calls are answered instead of going to voicemail, and checks are issued faster, then satisfaction will likely increase. If the higher settlement amount meets, but not necessarily exceeds, previously set expectations, higher satisfaction may result. This is a simplified process that doesn’t reflect the phone tag that usually occurs. Still, a minimum of three calls are required to answer a question that might have been answered on the first call. Better yet, if the information were available online, no calls would have been required, saving agency and claim adjuster time as well as telephony costs. Clearly, having the right level of staffing and meeting customer expectations regarding settlement are important to maintaining or improving customer satisfaction. But hiring more people or paying more than required will not necessarily increase satisfaction unless the fundamental communication and cycle time requirements are met. Insurers would be better off focusing first on those opportunities that improve customer satisfaction and reduce cost at the same time – creating a “win-win” – as opposed to throwing money at a satisfaction goal, with negligible economic benefit. How do you increase satisfaction without increasing staff? Tagged with Claims Operations, Claims Staff, Communications, Customer Focus, Customer Service. This is an outstanding article. One additional thing I would suggest is the proper training for personnel. With the ever increasing use of claim central in office operations, the experience level has dropped significantly from the use of experienced field personnel. I constantly hear complaints from experienced adjusters on our site extremely frustrated with staff in office adjusters critiquing their field estimates and requiring estimate changes that don’t even make sense due to their lack of understanding. One example you can’t ever forget is an in office adjuster calling the field adjuster and telling them to remove the finish carpentry item crown molding because mold is not covered under the policy! Things like this are a constant these days and do nothing but delay a reasonable settlement with the insured. This article is very well done. Often times problems arising with claims satisfaction are easily settled by creating a connection with the client so that they feel engaged and that their concerns have some level of worth with the company that they’re filing the claim. The shortening of the claims cycle is one effort that can be achieved by being organized. This allows the agent working on the claim to focus on the issue rather than having work toil over paperwork to keep up to date on their client’s claim. We often spend time working with different ClearRisk clients to show them how having all of their information better organized will allow them to cut their claims cycle and allow them to focus more on their client relations. Melissa Loew clearly understands excellence in Claim Service from both the frontline and the corner office. This is fresh and valuable thinking for anyone responsible for Claim service delivery.